The Full Force Forty-Seven hour Transformers Marathon is now online! Okay, okay… maybe not quite forty-seven hours. The Full Force has posted Series 4, Episode 9 of their awesome podcast, this time featuring a plethora of content about Transformers! They speak to former Hasbro Transformers and G.I. Joe manager Marc Weber and dig into the awesomeness that is Transformers lore for a solid NINE HOURS. It’s bound to be some good listenin’! Check out the latest episode on Podbean (also embedded below and be sure to check out the show notes on the Full Force Facebook page, they always have a ton of images and great details straight from the show. First and foremost, a HUGE thanks to Josh over at YoJoe who has been doing spectacular work with their comic archive, tying the IDW Universe together, even as G.I. Joe has been criss-crossing continuity with other Hasbro properties. He’s managed to make it easy to follow and make sense, and with the latest reveal of Marissa Fairborne, he goes above and beyond! He’s written a terrific guest post for GeneralsJoes.com which you can read below. Again, big props to his loyal and devoted following to the ongoing IDW continuity and how this all ties back to history. Some really great stuff! Big News in the GI Joe and Transformers world has just happened in the IDW comic Optimus Prime #3! An event literally 30 years in making has finally been confirmed (In continuity). Summaries of all of the different series can be read at YoJoe.com, so you can follow the stories. Yes, its official, Marissa Faireborn of The Transformers Earth Defense Command is the daughter of GI Joe’s Flint. And they actually sit down together in a coffee shop and talk. For 20 years it was only rumored that Marissa was related to Dashiell and the mother was a mystery. Outside of a DVD commentary, no cartoon, comic or other media has ever confirmed their relationship. Now for the first time ever and within the IDW continuity, the Joe and Transformers worlds have been combined allowing a long time meeting between Flint and Marissa to happen. Both GI Joe (not ARAH which is written by Larry Hama) and the Transformers along with Action Man, MASK, ROM and Micronauts are all included in the IDW continuity. The mini-series Revolution recently tied all of the Hasbro properties together into one universe. But one mystery that has never been solved officially in any cannon is who is Marissa Faireborn’s mother? Let’s dive into some Transformers and GI Joe history that got us to this huge reveal. First, in 1985 Series Four of GI Joe A Real American Hero toys, a character named Flint aka Dashiell Faireborn was released. He actually premiered in GI Joe: the Revenge of Cobra cartoon episode #1 “In Cobra’s Pit” on Sept 10th 1984, he is voiced by actor Bill Ratner. Flint has been a leader of the Joe since his first arrival in toys, comics or cartoons. And in both the comics and cartoons his love interest is fellow GI Joe Lady Jaye aka Alison Hart-Burnett, who also was released in Series Four. Flint’s in continuity cartoon stories took place in the 1980s. On September 16th, 1986 a new character named Marissa arrived in the second episode of the third season of the cartoon The Transformers. The title of the episode was called the “Five Faces of Darkness, Part 2”. 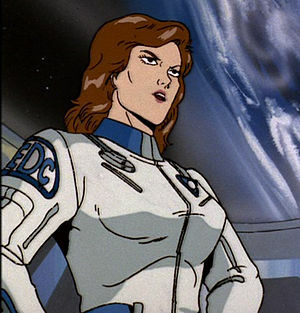 Marissa Faireborn was part of the Earth Defense Command (EDC) that was helping and fighting the Transformers on Earth. In the timeline of the Transformers series continuity, Captain Faireborn was living in 2005. At the time of Marissa’s premiere on the cartoon, GI Joe and Transformers had no official connection between the toy lines. This was the first hint of many crossovers to come in the 30 year history of Hasbro toys and the Faireborn family. In The Transformers cartoon episode called “The Killing Jar” with had an airdate of Sept 29th, 1986. Disguised as a shuttle, the Transformers Quintesson ship docks with an EDC space station, and Marissa Faireborn is lured on board by an illusion of her father. Although not officially called Flint, this character is voiced by the same actor Bill Ratner who performed Flint in the regular GI Joe cartoon. “Flint’s” appearance in this episode has him with grey hair in his 60s, still active with the military and in good if not distant relations with Marissa, at least well enough for the projection to fool her. Happening in another part of the Hasbro universe, released in January 1987 in Marvel comics, was a completely different kind of crossover between GI Joe and the Autobots. Writer Michael Higgins wrote an official in the ARAH continuity 4 issue mini-series called GI Joe and The Transformers. Now this mini-series does not contain nor reference Flint, Marissa or even the Earth Defense Command. But forever became official A Real American Hero cannon, whether the fans liked it or not. Over in the United Kingdom, on August 8th, 1987 issue #125 of Marvel’s UK The Transformers is released with an original crossover story called Ancient Relics Part One. The rest of this story also appears in the Marvel UK Action Force comic #24 titled Ancient Relics Part Two, #25 is Part Three, #26 Part Four, #27 is Part Five. Flint is the leader of Action Force in the UK, when in the London underground a Transformer is discovered and it’s Megatron. Autobots Wheeljack, Grimlock and Blades all fight with Flint and his Action Force team against Megatron. Additionally, the Ancient Relics storyline was reprinted in 5 parts in the UK’s Action Force Monthly (Issues #1-6) in 1988 which in America is called European Missions (Issues #1-6) as in 1988. It has always been debatable whether European Mission is officially part of the ARAH continuity. But either way it is still an original story that crosses over Flint with The Transformers, presumably before Marissa was even born. 6 years later in 1993, The Transformers appear within the GI Joe A Real American Hero comic starting with issue #139 until #142. Now this is officially within the ARAH continuity. Megatron shows up and partners with Cobra Commander and of course the Joes fight them. At the conclusion of #142, Marvel’s The Transformers Generation 2 becomes a spin off comic book series starting with #1. The GI Joe’s only appear in 3 issues of the series and Flint appears in Transformers Generation 2 #6. Since GI Joe and Transformers first official crossed over they have since crossed over in comics numerous times with several different publishers since 1993. Generally, each of these is their own continuity and the publisher’s were Devil’s Due Publishing, Dreamwave and IDW. The Dreamwave Transformers GI Joe series has the Joes fighting in World War II against The Transformers. This series introduces Nathaniel Faireborn who is Flint’s father and Marissa’s grandfather. In the Devil’s Due crossover series Flint actually goes to Cybertron. In Dreamwave’s G1 Transformers series Marissa now holding the rank of Commander, rather than Captain, portrayed as a member of the EDC, which in the Dreamwave continuity clandestinely handles terrestrial/extraterrestrial encounters. Following the Transformers’ return to activity on Earth early 21st century, The Transformers plans were stopped, but Marissa’s superior officer did not share her fondness for the Transformers. Dreamwave’s bankruptcy and subsequent closure left remaining stories of Marissa Faireborn untold. Marissa was a key character in US the Transformers cartoon series but never appeared in a Marvel comic in the 1980s. In the 1990s in a comic in Japanese, Manga style, that was never released in America and connected to a radio series, this is called KISS Players. Marissa as a child in the 1990s, lived in New York, where she met and became friends with Shaoshao Li, who developed an extremely strong attachment to her. The young Marissa resented her military father, so when one of his missions went awry and she and her father had to be rescued by Optimus Prime, she quickly came to view the Autobot leader as a surrogate father figure… and perhaps a little bit more. Ok, so that covers comics and cartoon references between Flint and the Joes and Marissa and the Transformers. In recent years the toys have started to crossover Joes and Transformers and the Transformers and GI Joe Collector’s Club in 2015 released a Marissa Faireborn toy, see the GeneralsJoes toy review. But who is Marissa’s mother. And now you know and knowing is half the battle. But we don’t know who Marissa’s mother is within the IDW continuity. Stay tuned. We first heard about this at JoeCon this year, and now the Collectors Club has posted their Transformers/G.I. Joe boxed set up for pre-order with an estimated ship date of December! Along with the boxed set itself, the Only Human versions of Arcee and Hot Rod are also available. Check out the latest G.I. Joe Collectors Club pre-orders right here. IDW Revolution original art on eBay! Revolution #1 has been released and a couple of the excellent variant covers have been produced by Adam Riches, who is well known to G.I. Joe fans as one of the artists of the Figure Subscription Service cardbacks. He has done a couple of fantastic variant covers, and he has listed some of his original art on eBay . One of the auctions is the Optimus Prime/Scarlett action figure cover and it looks really great. Any G.I. Joe or Transformers fan should check out his listings on eBay now and get these great pieces while the getting is good. I was away from the computer for a bit tonight, but wanted to catch up for folks who may not have seen it. After the G.I. Joe Collectors Club roundtable, they put the figures on display from the Transformers/G.I. Joe 5 Pack! Over at the YoJoe Photo Galleries the images have been posted, and I’ve got them mirrored here as well. Scarlett and Biggles Jones are looking pretty great! It’s tough to say whether the leak of information and images had anything to do with a reveal of the upcoming G.I. Joe/Transformers ComicCon set, but whatever the reasoning, we now have official press photos of the set to share as revealed by Uproxx yesterday. Leaked images of upcoming ComicCon set reveal more Transformers/G.I. Joe connections! EDIT – Original source of the images (as I should have guessed) is ACToys here. I’ve mirrored a bunch more images and added them to the gallery below. This set is looking even better! Labeled as only coming from the “Chinese Web” new images of what is believed to be the upcoming G.I. Joe ComicCon set have emerged on the G.I. Joe Discussion group on Facebook. This year’s SDCC exclusive appears to be a Rattler repaint as Powerglide, with Scarlett facing off against a HISS repaint as Soundwave, with Zartan! Very cool looking repaints, for sure, and I’m loving that Scarlett build, though not really wild about the 25th Anniversary head sculpt. I really loved the Retaliation Zartan as well, it will be interesting to see what the differences are between this one and the previous. Choosing the repaint the Direct to Consumer HISS Tank is an awesome idea, too, and I’m digging those Soundwave missile launchers at the turret. Really creative stuff. Not only is it cool to see these, but there are two slots in the crossword puzzle to fill in! Check out the mirrored images below, and hit up the G.I. Joe Discussion Group on Facebook to join in the talk!